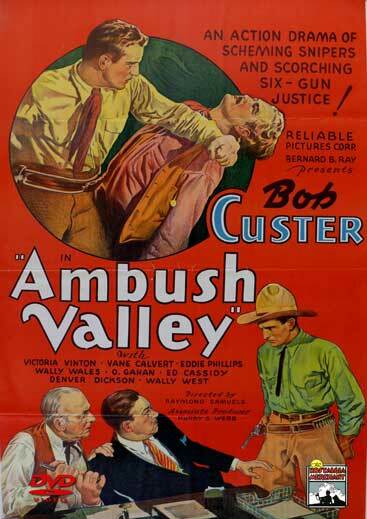 Ambush Valley is an action drama of scheming snipers and scorching six-gun justice! When Clay Morgan kills Joel Potter, Marshal Manning has to arrest the brother of the girl he plans to marry. When the Morgans effect Clay’s escape, the Potters take Ann Morgan as a hostage. Manning is now caught in the middle and the two sides are about to fight it out. Starring: Bob Custer, Victoria Vinton, Vane Calvert, Eddie Phillips – 1936 – BW – 57 Minutes. DVD, Digitally remastered.